Synthetic peptide within Human SCP1 aa 1-100 (Cysteine residue). The exact sequence is proprietary. Our Abpromise guarantee covers the use of ab175191 in the following tested applications. WB 1/1000 - 1/10000. Predicted molecular weight: 114 kDa. Consists of an alpha-helical stretch of 700 AA residues, flanked by N- and C-terminal globular domains. The C-terminal domain has DNA-binding capacity. Nucleus. Chromosome. In tripartite segments of synaptonemal complexes, between lateral elements in the nucleus. Found only where the chromosome cores are synapsed. Its N-terminus is found towards the center of the synaptonemal complex while the C-terminus extends well into the lateral domain of the synaptonemal complex. 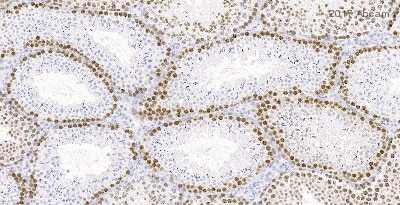 Immunohistochemical analysis of paraffin-embedded Human testis tissue labeling SCP1 with ab175191 at a 1/100 dilution. ab175191 has not yet been referenced specifically in any publications. Publishing research using ab175191? Please let us know so that we can cite the reference in this datasheet.